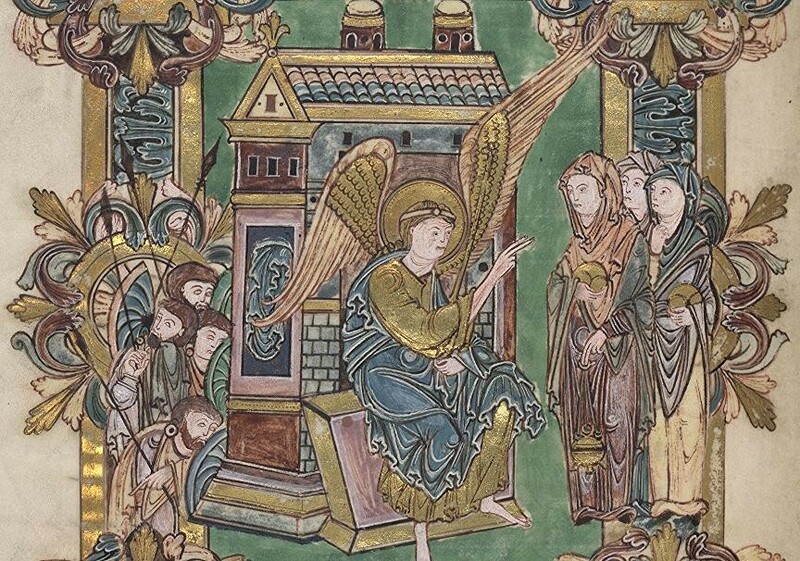 The angel and the women at the empty tomb. I bring you greetings from Jessica, who tells me that she misses us and prays for us as we do her. She is also pleased that you read and enjoyed her posts that we brought over from NEO, and it gave me great pleasure to do so, as well. I know that you wonder, as do I, whether she will return to us, and not least to the blogs. I don’t know; she doesn’t know. She says there is much she misses about them, the give and take, the camaraderie, the learning and the teaching. But she also says she grew weary of personal attacks, and was increasingly hurt by them. And so, only God knows, and he hasn’t told anyone yet. Personally, I pray, and suspect many of you do as well, for her return. But while I have told her what I think, as I usual, I will not presume to urge her to do so. That is for her to decide, with God’s help. Nor would I presume to attempt to substitute my judgement for hers. I have far too much respect for her to do such a thing. And so, our newer readers have had an opportunity to read Jess’ work over a few days, and to see why we have all come to love her so, and why we link so often to her posts. The Testimony of a Woman, is a powerful thing, indeed. Probably the things that unites all the contributors here are first, our love of our Crucified and Risen Lord, but also, I think we all love teaching. Chalcedon, and Jessica are trained teachers and yet as I told Jessica once, one of the main things I miss about not being in the field anymore is the sheer joy of teaching someone to be better than I ever was. The importance of women is something that goes to the very beginning of Christianity. I have said before that if you would understand the role of women in Jesus’ time, you have only to look at fundamentalist Islam, it is simply a milder form of what was. And yet in the Annunciation, we see the Angel sent to tell Mary that she would bear Jesus, reassuring her until she assents saying, “Behold the handmaid of the Lord; be it unto me according to thy word,” That is not submission, that is informed consent, to something that she knew could, at best, make her a pariah, and at worst cost her her life. And so she pondered, and carried out the mission. She looked into the tomb again, only to be met by the most amazing sight – two angels asking her why she wept. The answer she gave echoes down the ages: “Because they have taken away my Lord, and I do not know where they have laid Him.” As she turned away she saw a stranger, whom she took to be the gardener and asked where Jesus was. Then the man spoke – just one word, one word which shattered the world as she had known it and which echoes down the ages, even to the end of all things. ‘Mary’ was that word, the first from the lips of the Resurrected Lord. However much her tears had blinded her, that voice was clearly unmistakable: “Rabboni!” She said. Teacher, teacher, that was what she called Him. She went to cling to Him and He said: ‘I am ascending to My Father and your Father, and to My God and your God.’ He bade her to go and tell the others what she had seen. And so she did, and so does Jessica, and so should we. The Testimony of a Woman, God’s chosen method of communication with us, the most powerful sound in the world. A very interesting choice of topic for a post, and one which seems to emphasise how Paul saw Christ and the Gospel: “a stumbling block to the Jews, foolishness to the Greeks”. A favourite verse for the down-trodden, and very applicable to Mary Magdalene et al: “But God hath chosen the foolish things of the world to confound the wise; and God hath chosen the weak things of the world to confound the things which are mighty”, which actually looks remarkably like Mary’s Magnificat. A good OT parallel for Mary is Samuel’s mother, Hannah. I sure do miss Jess’ voice her: there is no replacement for a woman’s take on things, not even male effeminacy. Well, you know that phrae rattled around in my head all day yesterday, and this is the result. More could have been done with the Magnificat but I was a bit wordy, as usual. i do as well, there is no substitute I have found for Jess’ voice, the only palliative I have found is her old posts. True, and this was so important regarding issues like the role of women in the Church and sexuality. Jess is an example of a woman who does not approve of women priests, and was able to write about the estrangement of the genders from the woman’s point of view. For some time I have been considering writing about the matter from the man’s point of view – of course, that risks being too personal for a blog post, so I am still mulling it over. True, and strangely there were several of us last year (and not who you would expect) that urged her to read for the priesthood in her Anglican Church. I’ve been tempted as well, and haven’t figured it out either. One parallel that she showed me is that her veneration of Our Lady comes from wanting a mother figure to talk to. In a way, its a role usually done by clergy wives, which may be why in Protestantism Marian Veneration waned. I’ve had two female pastors, one Lutheran and one High Episcopalian, both were very good, but it was a different feel, not bad, just different. Yes, it makes me uneasy, myself. I’ve attended churches with female pastors or preachers and I haven’t found their preaching bothersome when I listened to it. The Anglican church I used to attend had an evening where the principal of a theological college argued for women bishops, and at the time I thought his arguments reasonable. But I went back to Paul, and I couldn’t shake the feeling that he was wrong. Of course, being low church, I don’t have the same theology of priesthood as others (Persona Christi etc). I just feel that what Paul says about women leadership and preaching shows signs of limitations. I certainly feel it is wrong to force women leaders on churches that don’t want them – that shows no respect for individual conscience and violates what Paul says about respecting fellow believers. Regarding sexuality – I think Theophiletus was the only other person last year…see, it’s theoretical if you’re strait – you don’t know what it’s like to struggle with. I’ve pretty much come to believe that it’s mostly cultural, which doesn’t mean the unease (including mine, BTW) isn’t real. With Paul also, I think we have to resolve cultural issues there as well. You hit on one difference certainly, there is a difference between a priest and a minister, although we don’t speak of it all that much. As to women bishops, well as I’ve said before, if one is going to have women clergy, it’s completely unreasonable to preclude them from the Episcopate, Bishops should be the best of the best, and so it’s still another slippery slope. I think you’re correct there, I try hard to be empathetic, and Jess helped me much but i can’t really know what it’s like, I do note though, that it’s a two way street. The key point in all this is, I think, to have respect. We’ll all disagree with some but we should not denigrate beliefs honestly held, and that’s sometime hard as well. Indeed – just being here over the past couple of years has really mollified me regarding Catholicism. You should have seen me in my earlier days – like a drawn sword. I’d tell anyone and everyone: Jesus is coming, repent and be saved. In a way I think I really ought to stir that evangelical zeal to life again…but how to do it without being a hypocrite or a bully.